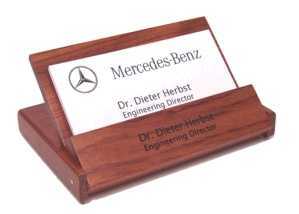 The ever popular Rosewood Folding Card Holder look great when folded closed or open as a desk top display. Each Card Holder is sanded smooth and has a clear coat applied – arriving ready to engrave. The rosewood engraved a dark brown color with excellent contrast. The Rosewood Folding Card Holder will hold approximately 30 business cards.